Mariah Carey's Christmas Special extravaganza aired on the ABC Network yesterday- much to my excitement- and contained material from both Merry Christmas ii you and Merry Christmas. The show was clearly a high budget affair, with a stage that was decorated beautifully with trees, lights and plenty of glitter. The production also featured a live band, a strings section, a choir and occasional dancers, as well guest appearances from Randy Jackson and her mother, Patricia Carey. There was some trepidation from me in viewing these performances because, as commented on in my review of Merry Christmas ii you, I had suspicions that some of the vocals on the album may have been enhanced with studio magic, especially when compared to the voice found on her last album Memoirs of an Imperfect Angel. However, not ready to 100% believe that little voice of doubt in the back of my head, I deferred a conclusive opinion until I'd heard Mariah attempt to sing the songs live. Oh Santa:Best performance of Oh Santa yet. Surprisingly the whistle at 1.49, which i thought was auto-tuned on the album due to its odd trajectory up and down the scale and tinny quality, may not have been so. She sings it almost exactly the same here but changes it a bit by stopping it on an earlier note to allow her to catch her breath. O Little Town Of Bethlehem / Little Drummer Boy Medley: The crowd rose to their feet after this rousing rendition, but surely those belts were too pristine to be live, right? At 2.53 is an example of why this performance is making me waver when trying to decide if this was lipped or not. Much of the vocal is clearly live but sounds so in keeping with the tone and texture of the the belt that leads up to it-which I suspect is lipped- that I don't quite know what to think . Oh Holy night: An almost carbon copy of the 2000 version of the song. Was convinced this was lipped until the head note that starts at 2.24 and the wavering that happens at the end of its run. However still not convinced with the liveness of the belt that proceeds it. Here Comes Santa Claus (Right Down Santa Claus Lane)/Housetop Celebration:Randy Jackson joined Mariah on stage for my least liked song on the album. Performance was vocally on point and the crowd seemed to enjoy it, getting up to dance. The hamming up of her actions on certain parts screams "lipped". 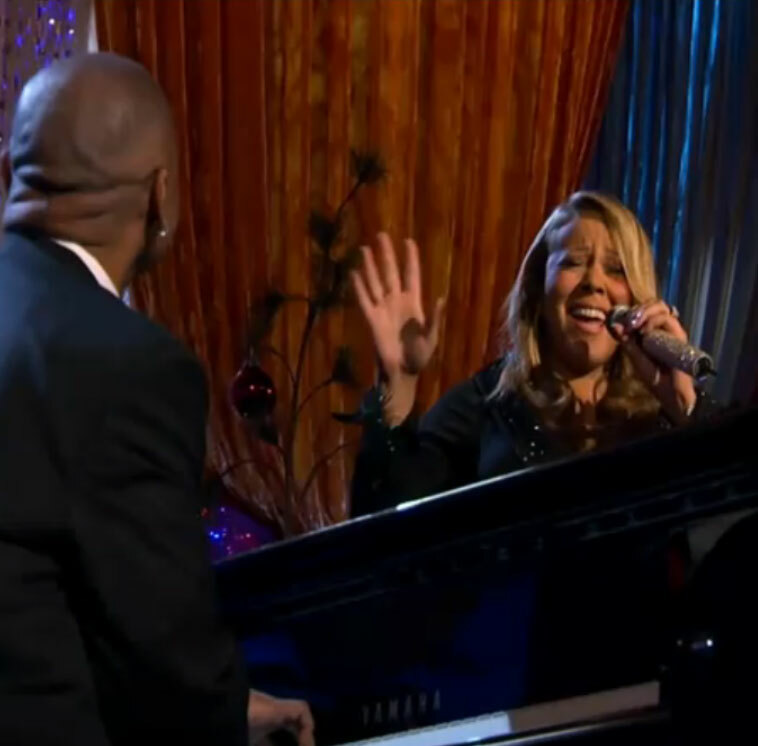 Charlie Brown Christmas: Just Mariah and no backing vocals to fall back on or blend into.Fully live, fully awesome. Perfect example of the improvement in texture and quality of Mariah's whisper register. When Christmas Comes:"It's Christmas right?" love the contrast at 1.52 between Mariah's low, thick, alto speaking voice and the light, bright, whistle note that follows. The belts are lipped but Mariah gets a "get out of jail free" card for this since it contains a lot of high and sustained belts that could have exhausted her voice mid-way through the show. O Joy to the World: Loved the arrangement and the vocals were strong and almost effortless, but you can see they were live with mistakes such as 1.55 where the note didn't quite make it out. My favourite performance of the song after her BET performance a few years back. Christmas time is in the air again: A live performance that is virtually a copy of the studio version.The high noted "time" at 2.25 going off key for a split second is for anyone who doesn't think it is. 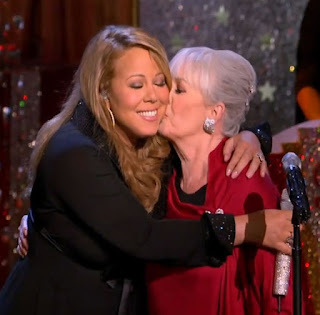 O Come All Ye Faithful/Hallelujah Chorus: The moment anyone who has listened to the album was waiting for: the duet with Mariah and her mother! Unsurprisingly, but surprisingly at the same time, it was spectacularly live and near enough note perfect. Watch how Mariah runs out of breath at 3.20 after the belt, so has to come in late, if you need proof of it being live. Patricia Carey's voice was stunning, and she made singing looking effortless-especially in contrast to Mariah, who was making some odd faces in the introduction as she navigated her voice- but you'd expect no less from a retired opera singer.Mariah and Mother need to record an album together.Nuff said. defined and even in texture and tone throughout the range; all qualities that have been in decline since the Charmbracelet album. But there were still suspicions in the back of my mind that parts of the vocals had been pre-recorded. For every small crack in the voice and off note that showed it was live, there was a high E or F that was so strong and consistent that it couldn't have possibly been live if going on recent performances. Live or not, the most important thing is that Mariah Carey convinced me that the vocals on the Merry Christmas ii you album were all hers, and unaided by studio wizardry. I was at the taping and I can say that she was 100% live. It was amazing. They actually did 2 takes of the duet with her mom, because her mom missed her entrance at the beginning of the song. They also redid the 2nd half of "When Christmas Comes" because the 1st time they didn't do it as rehearshed according to her. We got to see her bantering and doing stuff on the spot. I think that there was a voice crack in the 2nd verse of "O Holy Night" that got edited. But it was live and amazing. If they do parts of songs that weren't, then I couldn't tell.....she was amazing. I think you forgot to comment on the huge amount of chorus that was applied to her voice. The chorus doesn't hide any vocal deficiencies; it's more of an enhancement effect, but it is very strange to hear it during the talking parts, as if someone fell asleep at the board and forgot to turn it off. The writer of this story clearly must be young or has not followed Mariah Carey's career well. She has always "whistled" as the writer called it. Never has it been an autotune production. That is junk for those who cant belt notes like Mariah. Did you not know she had studied Opera as a child and older. From the sounds of it each year she still has it...except the time she disapeared from music for awhile. But much greater come back of vocals than many. As long as she stays focused and practices she will "whistle" far in age. Forever Mariah Carey fan. Hello, at the poster above, I think you may have misunderstood what I wrote. I was never questioning her ability to whistle or hit those high notes naturally. I was questioning just that particular whistle in Oh Santa. What I have an issue with is the trajectory and the tone of the whistle. The swiftness that she ascends and descends the scale during that whistle (around 2.46 on the album version) is not only something i have never heard her do in that register- please point out another song she has done that in if i'm wrong- but it just sounds plain unnatural and unlike any Mariah whistle note I have ever heard in that it has a mechanical,computerised tone or effect to it. Thanks for the comment. I hope that clarifies what i was trying to say. Oh and I will say this, I'm not a lamb but "Misty Moon" is all I can say to anyone who questions my knowledge on Mariah Carey music. lol. If you really listened to her voice throughout her career you'll notice that the tone of her whistle always changes, almost in every album, particularly in the 90's. As she grew older, her voice changed and matured, and it still is. Her voice is just incredible and this performance was NOT lipped, nor was the whistle in 'Oh Santa' made by a computer. Don't underestimate the power of her voice. People who doesn't follow Mariah Carey's carrer do not have the skill to talk about her voice. Mariah's whistles are larger than live. When she's in a good day, she can do anything. If you don't believe me, then watch the Michael Jordan's tribute, when Mariah sang "My saving grace" and even used the whistles to SPEAK some words of the song. hey, fellow, that's Mariah. You obviously do not know how talented she is. Hello LH. My comment about Mariah's whistle had nothing to do with her being able to intonate in that register. Shes been demonstrating that ability from her first album-For example during the ending of "All in your mind" Mariah clearly sings the words "its all in your mind" while in whistle register. I was commenting on the swiftness that she sang those notes. The closest I've heard Mariah do that before is at 3.45 of "Yours" from the Charmbraclest album, but the texture and sound of that whistle is totally different as to that on the Christmas album. And also, Mariah Carey has said it herself that she never really has "a good day" when it comes to her range as a whole. She said in this clip http://www.youtube.com/watch?v=185XyDE17mw at 2.27 that her whistle register works best when her voice is Raspy, but when her chest register is clear sometimes she can't even sing any whistle notes at all. This being the case if we apply this to her Christmas show, when she had clear and bright chest voice, what should that mean about the whistle notes we heard? I'll leave it to the readers to come to their own conclusions. If this is a new ability, in her whistle register, that has come with her voice maturing then i look forward to hearing her do it on further recordings. In regards- once again- to not being a "true fan", my fanship of Mariah is not based on her being able to hit high notes. I'm much more a fan of her buttery tone, dark low notes, clear chest register and her production and writing skills. I feela bit peeved at fans who use Mariah's range as an argument for her being a great singer. It does her a diservice as an artist and infact is one of the reasons a large portion of music fans are turned off by Mariah. Although I like the way Mariah uses her whistle register, it will always be the last argument I'd use to convince someone why Mariah is a great artist; I will always stand by the fact that A large range does not equal a great singer. Lamb or not, I love your analysis of this concert. :) I was also questioning whether or not some songs were lip synced, but agree with you that no matter what, she is an incredible singer. 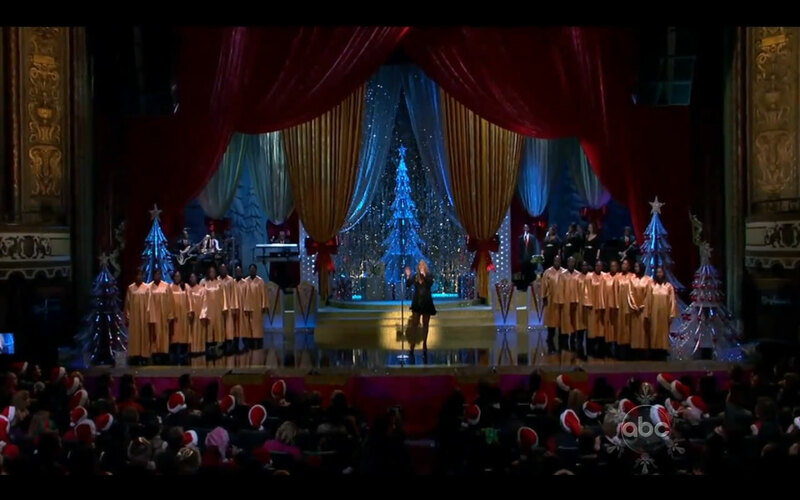 I was immediately skeptical about the O Holy Night performance, thinking it was ripped straight from the 2000 performance. But after listening to them side by side, I have heard so many tiny differences in the way she sings certain words that I am almost certain that this was about 85% live. A few of the big notes were obviously lipped. If shes lips, so why does she sing live even when her voice is not well? No sense!!!! Here, in Brazil, Mariah is like a queen - we all love her. Her show in São Paulo was amazing. Paoul Macartney, Beyonce, Bon Jovi, Eminem and many other played their best here in Brazil last year. But Mariah was voted for 2010's best live show, on a famous web site. So people, deal with it. When Mariah's voice has a good day, she sings like no one else does. she sang on point and it was ALL live! my word, are you deaf and dumb???! I just ordered Merry Christmas II you, I'm not normally the sentimental type but I really love her vocals on that album, also I did by Merry Christmas not long ago, I love it! It's just a shame that it feels strange to listen to it all year round.